I worked with Scott LaPoint to study suburban fishers in Albany, NY. We used a new high-resolution tracking collar to learn exactly where these fishers were going, and build dynamic brownian bridge home ranges. These data allowed us to identify Animal Defined Corridors, showing how individuals moved between core feeding areas. We also asked – Why fishers in the east are doing so much better than in the west? We discovered that they face fewer predators in the east, eat larger prey in the east, and have evolved larger skull sizes to deal with this. All this suggest eastern fishers are benefiting from mesopredator release. As a punctuation point on their recover in the east, I reported on the first record of a fisher in New York City when a male was photographed in the Bronx in 2014. During this field work in 2011 I also wrote blog posts for the New York Times, which are listed below. Scientists track fisher behavior in urban and wild settings to better understand the success of weasel populations in the northeast. 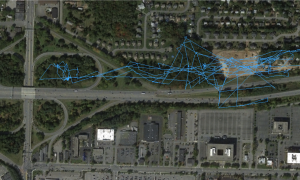 In deep snow, predators lilke fishers and foxes are less active in the forests near Albany, N.Y.
Data from a GPS collar show the exact paths followed by a fisher, paths that a researcher can follow later. Camera traps show more and more varied animal life in suburbia than in wild forests. Fishers in urban areas love to travel through culverts. Many people claim to have heard fishers scream. But researchers have found no evidence that they do. While looking for one radio-collared fisher, researchers near Albany, N.Y., receive news about another that had set out to find a territory of his own. 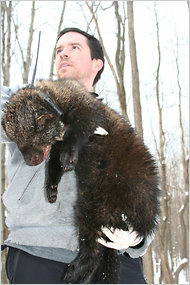 Scientists study a male fisher that lives in the Albany suburb of Latham. A zoologist considers the evidence for and against the popular notion that fishers prey on cats. In a new “personality” test, scientists examine whether suburban fishers are more likely than the large weasels in wilderness areas to approach novel objects and potential food sources.